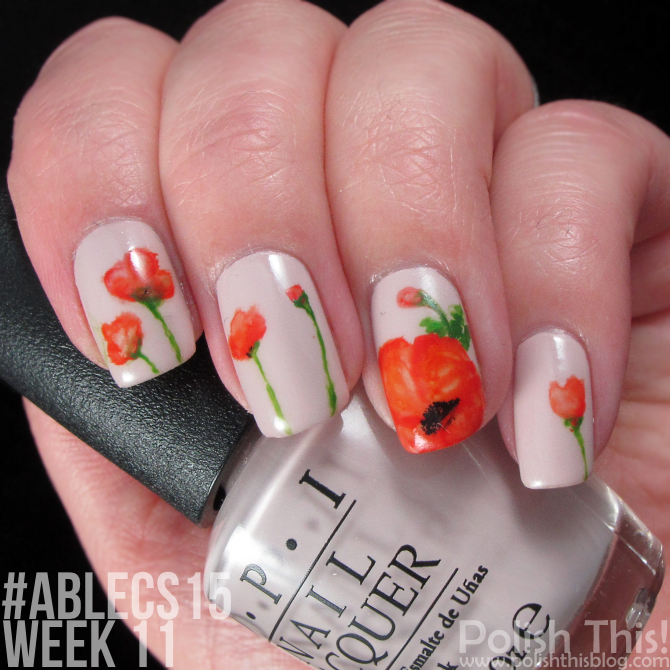 #ablecs15 Week 11: Blooming - Polish This! 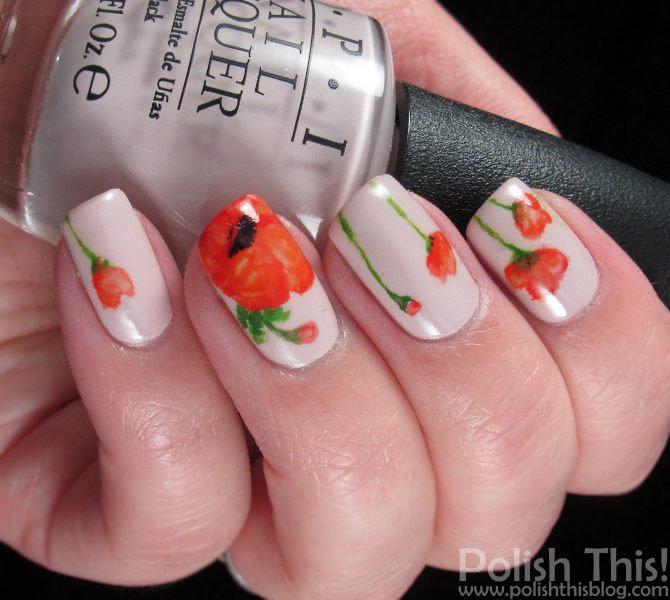 I wanted to do some freehand nail art for a change and what better challenge theme to do it that Blooming which I of course interpreted as flowers on my nails. I wanted to try something that I haven't done before, so here's my first attemp on doing watercolor effect flowers. I got the inspiration for this manicure from both Lucy's Stash and Will Paint Nails For Food, I just combined the ideas from both manicures into one. I used OPI Don't Bossa Nova Me Around as my base color and I did all the painting with acrylic paint. 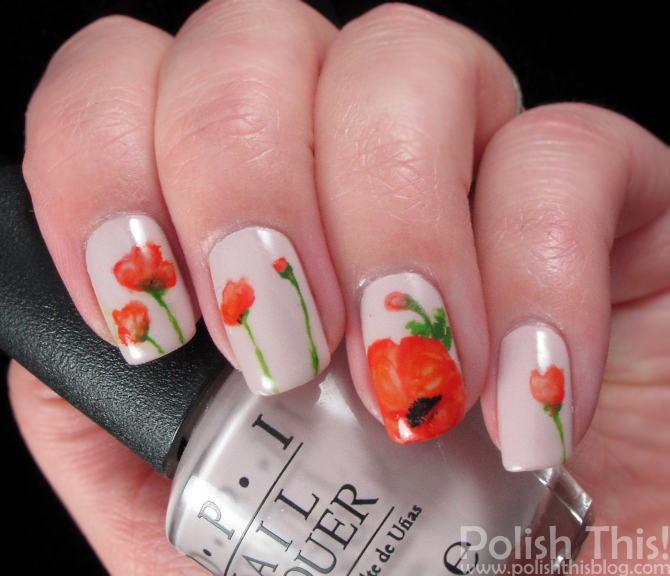 I really like the overall floral look and I think I even managed to make the flowers look at least somewhat like poppies. I followed Lucy's Stash's tutorial and added a coat of matte top coat (I used Cirque one) over my base color to make it easier to paint over it, but somehow this didn't work very well for me. When I watered down the acrylic paint, it just didn't stick on my nails, it just vanished before my eyes... So I had to use a bit more paint that I wanted to and so my water color effect isn't really looking too water colored at all, but all the same, I really loved the look on my nails! Kiitoksia hirmuisesti! :) Kiva kuulla, että näistä pidetään, varsinkin kun tämä oli omastakin mielestä kiva lakkaus! Stunning!!!! 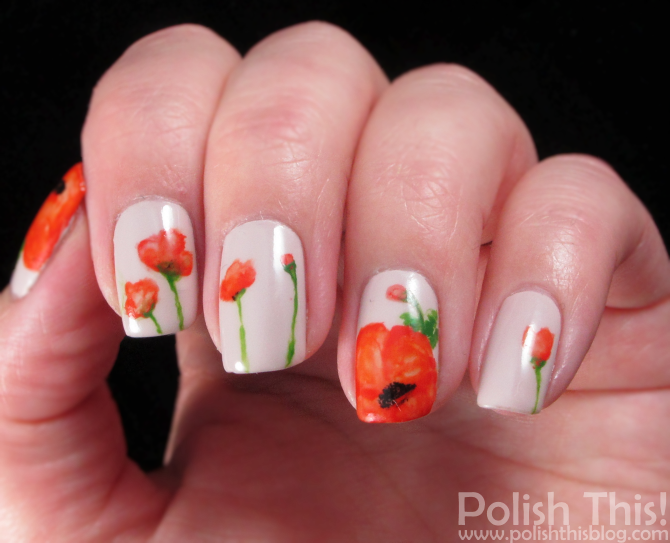 I wish I could paint flowers like these on my nails!